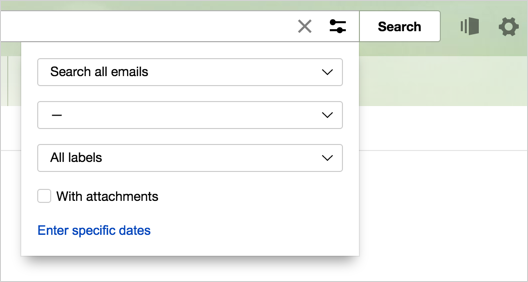 If you get a lot of emails and want to quickly locate a specific one, you can use the search function. Just enter any information about the email that you remember in the search bar (on the top of the screen to the right), such as the name of the sender, the date when you received it, or some words from the body of the email. If you can't remember what exact grammatical form of a word was used, type any form into the search field and Yandex.Mail will locate all your emails that contain a form of that word. For example, if you search for [estimate], you will find messages containing phrases like “I'm sending you the project estimate” and “Which of the two estimates is based on the new prices?”. Yandex.Mail also finds the email you're looking for if you search by attachment name or by text contained in the attachment. If you want to find all messages from your social network profile, click Social in the Fast search filters section. You can also use the fast search filters to find all emails from certain people, coupon services, or even all emails with hotel reservations or tickets. If you are in the Inbox folder, search results will include emails from all of your mail folders except Spam. If you are in a certain folder or are viewing emails with a certain label, Yandex.Mail will, by default, search in this particular folder or among emails with this label. For example, if you are only looking at emails labeled From Fluffy, the search results will only show emails from your cat Fluffy, regardless of what you search for. If you do not remember the full name of your contact, start typing it – Yandex.Mail will offer suggestions. In the section Editing and sending messages → Message search, deselect the option include my previous searches in search suggestions. If you want to set more complex search conditions, click (to the right of the search bar) to go to the advanced search form. The email section, such as subject, text or Sender. Name of label (including standard labels — Important and Unread ). In the search results you will see a list of suitable emails from all indicated folders of your mailbox, except the Spam folder. Note. If you want to specify a field to search for a word, or refine the search conditions, use the query language. To delete an email from the list of search results, select it and click Delete. The first click sends the email to the Trash folder, but the email will still appear in the list. To permanently delete the email from your mailbox, select it again and delete it. Make sure that your query doesn't contain errors. Try limiting the number of words in your query. If you remember any other information about the email (such as names of attached files), include them in the search query. If you use the advanced search option, make sure that all the settings are correct. Attention. If emails disappeared from your Inbox and you can't find them by searching for them, they were probably deleted. For information on why emails end up in the Deleted folder and how to avoid sending them there, read the Emails have disappeared from my mailbox article.